An executive order signed today by President Donald Trump will require the federal government to scale back existing regulations whenever departments and agencies issue new rules. At least two prior regulations must be identified for repeal for every new regulation proposed, the order states. The principle behind the order – removing existing regulations when new rules are proposed – has been used in other countries, including the United Kingdom and Canada. “We’re going to create an environment for small business like we haven’t had in many, many decades,” Trump said during a meeting with small business owners, held shortly before he signed the order, according to The Daily Mail newspaper. The order sets a number of financial benchmarks. The cost of any new regulation must be fully offset by savings from repealed regulations, and the combined cost of all new regulations and those identified for repeal must be zero – or less than zero – for fiscal year 2017, which started on Oct.1 last year and runs until Sept. 30. By issuing today’s order, the White House is joining a broader push for regulatory reform after eight years of the Obama administration. In Congress, early efforts have focused on the Congressional Review Act (CRA), which allows for the repeal of regulations issued late in President Obama’s second and final term. As Western Wire has reported, the U.S. Bureau of Land Management’s “venting and flaring” rule, “stream protection” regulation and “Planning 2.0” process have drawn the early attention of lawmakers. 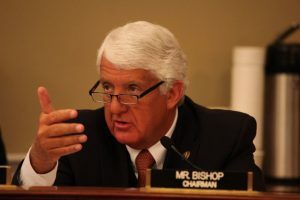 The push for BLM reforms is led by Western officials, including House Resources Committee Chairman Rob Bishop (R-Utah), Senate Environment and Public Works Committee Chairman John Barrasso (R-Wyo. ), Senate Energy and Natural Resources Chairwoman Lisa Murkowski and U.S. Sen. Cory Garder (R-Colo.). Bishop and Barrasso today introduced CRA disapproval motions in the House and Senate aimed at BLM’s “venting and flaring” rule. “This is the first of many steps we will take to cut red tape that is forcing job losses in communities across the country and undercutting our domestic energy resource potential,” Bishop said in a statement. Barrasso called on the BLM to speed the approval of new pipelines – not new regulations – to reduce flaring and venting of natural gas at some well sites on federal lands. Emissions from oil and natural gas wells were already subject to state and federal regulations before the BLM rule was finalized late last year, he said.